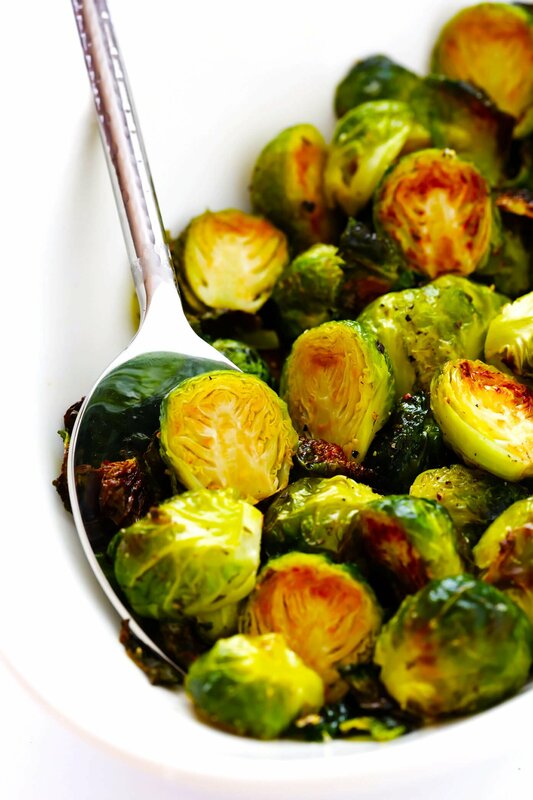 Learn how to make the best roasted Brussels sprouts with this classic recipe. They’re super-quick and simple to make, easy to customize with your favorite seasonings, and always so delicious. 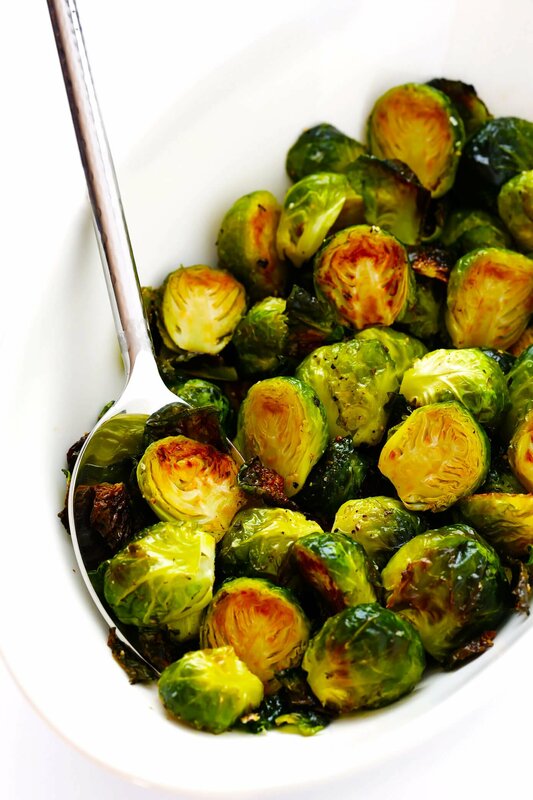 Raise your hand if you love roasted Brussels sprouts! And now that Brussels sprouts season has officially rolled back around again, you can pretty much count on these being on the menu as often as possible in our little kitchen. We freaking love Brussels sprouts. Love to shred them up for salads, stuff them in tacos, stir them in with pastas and gnocchi, add them to stir-fries, sprinkle them on pizzas — you name it, I’ll find an excuse to add Brussels to it. But the vast majority of the time, I usually just keep things simple and cook them my favorite way — roasted Brussels sprouts made simply with olive oil, salt and pepper. It’s the classic Brussels sprouts recipe that will never steer you wrong. It’s the healthy, gluten-free side dish that goes with just about anything. It’s easy to customize thousand different ways with your favorite seasonings or sauces. It’s ready to go with just 5 short minutes of prep time. And this time of year, it’s the dish I crave nonstop. So if any of you happen to be looking for tips on how to cook Brussels sprouts, here’s how I make them! Fresh Brussels sprouts: In general, the smaller they are, the sweeter they will be. The larger, the more they will taste like cabbage. Olive oil: Or your preferred cooking oil. Sea salt and freshly-cracked black pepper: We will use these liberally for seasoning! Although see below for ideas on additional seasonings/sauces you can also add. 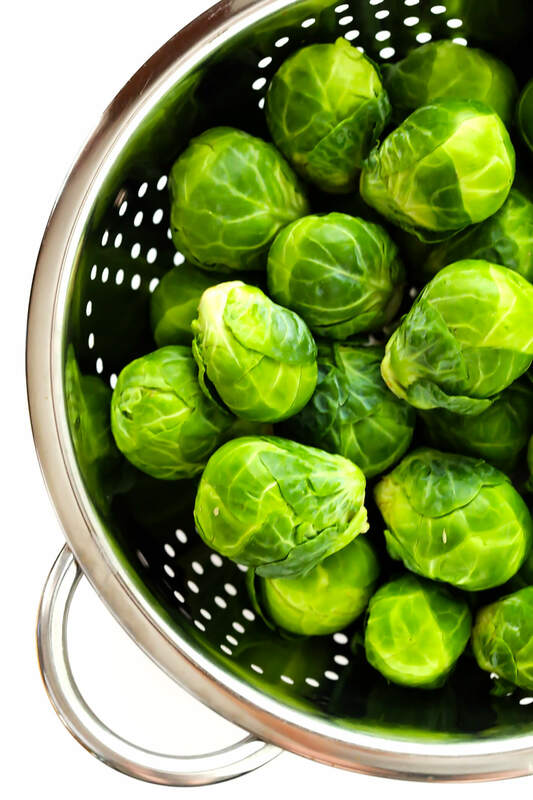 While your oven is pre-heating, give all of those sprouts a good rinse, and then pat them dry with a clean kitchen towel. Pluck off and discard any outer leaves that are looking a little browned or wilty. Then trim off the tough ends and cut each sprout in half lengthwise, being sure to save any of the leaves that fall off (<– especially if you’re like me and love those crispy little charred pieces). If you would like a visual, here’s a quick 1-minute video for How To Cut Brussels Sprouts (3 Ways!). Toss with oil. You can either do this in a large mixing bowl or directly on the sheet pan itself — up to you. Arrange on the sheet pan. 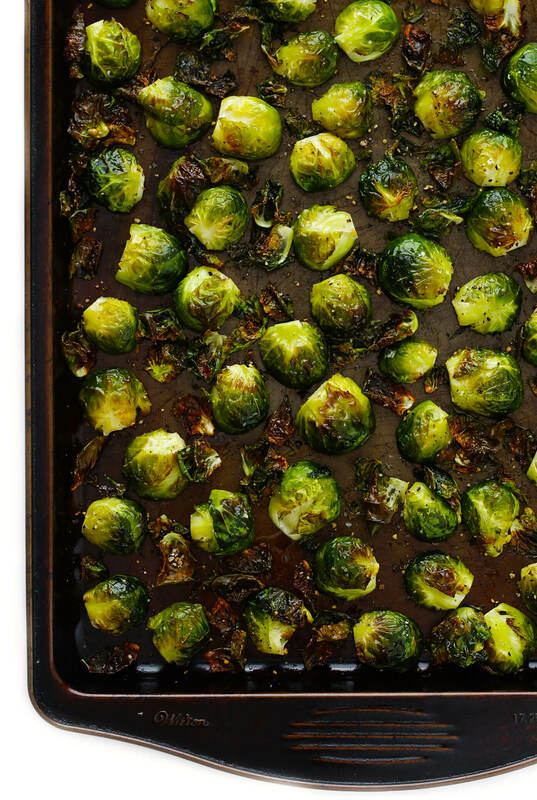 Spread the Brussels sprouts out in an even layer on your sheet pan. Season with salt and pepper. 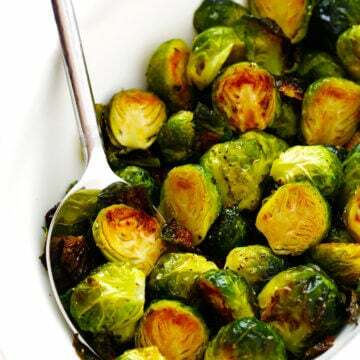 Sprinkle the Brussels sprouts liberally with salt and pepper, to taste. Give them a flip. Then go around and flip over each of the Brussels sprouts so that they are cut-side-down. If any of the leaves come loose, don’t worry — just nestle them in around the Brussels. Roast. 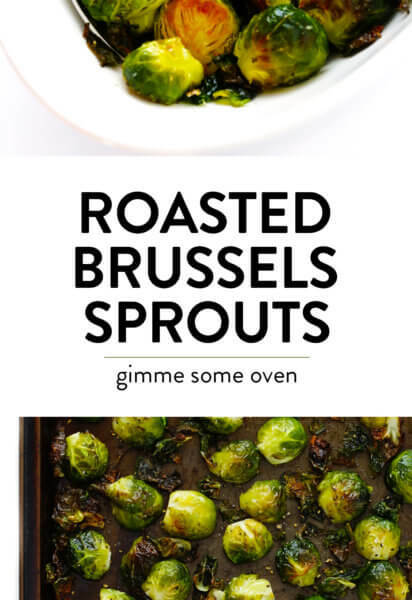 Then pop them in the oven and cook until the Brussels sprouts are browned a bit on the top and bottom, and any of those loose leaves are nice and crispy. Season. Remove from the oven, and give them a final taste-test. If they still need more salt and pepper, sprinkle a bit more on. Then serve warm and enjoy! Fun salts and peppers: I really love sprinkling mine with smoked sea salt. But any fun seasoned salts or peppers would be great here. Citrus: Fresh citrus juice (i.e. lemon, lime, orange) and/or grated citrus peel is always a winner. Vinaigrettes: This is a great use for leftover salad dressing, or you can whip up a quick homemade vinaigrette to toss with your sprouts either before or after roasting. I’m also a big fan of drizzling on a thick glaze for balsamic Brussels sprouts. Fresh Herbs: Any number of fresh herbs would be delicious mixed in, such as chopped rosemary, sage, cilantro, parsley, basil, thyme, or oregano. Cheese: Grated Parmesan is always a winner with baked Brussels sprouts. Or feel free to sprinkle on some crumbled soft cheeses, such as goat, feta, or blue cheese too. Nuts: Pine nuts, chopped almonds, walnuts, pecans, almonds, or pepitas would be delicious additions. Bacon: If you eat meat, crumbled bacon bits taste heavenly with roasted Brussels. Basically, there are countless ways that you can customize your sprouts. So have fun experimenting, and happy roasting this Brussels sprouts season! My favorite way to make classic roasted Brussels sprouts. See notes above for ideas on how to customize yours with different seasonings or sauces if you would like. 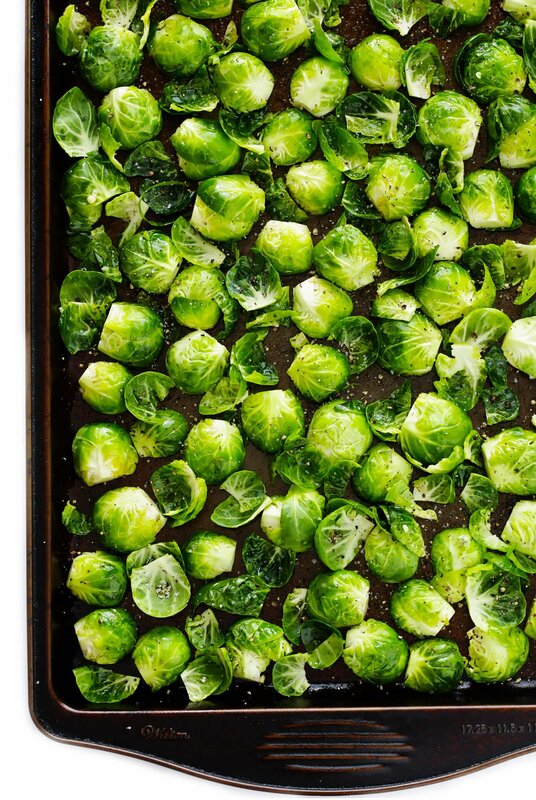 Spread the Brussels sprouts out on a large baking sheet and drizzle with the oil. Toss until the Brussels sprouts are evenly coated, then spread them out in an even layer on the baking sheet. Sprinkle evenly with a few generous pinches of salt and pepper, to taste. Then go around and flip each of the Brussels so that they are cut-side-down. Taste and season with extra salt and pepper, if necessary.